Cut off date for age calculation is 07.01.2015. Candidates should be residing in Anakaputhur Municipal area limit. 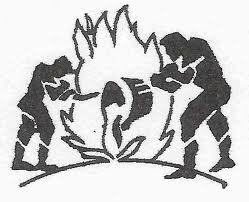 Roaster system and age relaxations are applicable as per Government of Tamil Nadu. PwD can get additional 10 years relaxations as per Government norms. 1. Proof for 8th Std qualification. ie 8th Std Marksheet, which is signed by School Head Master. Photo copy of this certificate must be attested by Gazetted Officer / Class 'A' Officer / Class 'B' Officer. 5. Testimonial Certificate from Gazetted Officer / Class 'A' Officer / Class 'B' Officer (This testimonial must be affixed recent photograph and this photograph also to be attested by the officer, who is issuing the testimonial). Roaster systems and age relaxations are applicable as per government of Tamil Nadu norms. There is application registration fee. 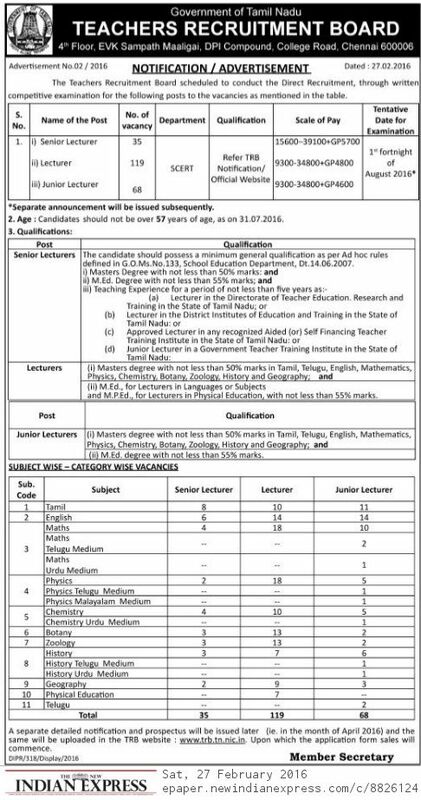 Interested and eligible candidates may forward their application form along with all necessary documents duly self attested to District Registrar Office, Vandikaran Street, Ramanathapuram District 623 501, Tamil Nadu on or before 29th February, 2016. Persons with Disabilities will get additional 10 years relaxations. Interested and eligible candidates may forward their application form alongwith all necessary documents duly self attested to The Executive Officer, Chitlapakkam Town Panchayat Office, 22, Second Main Road, Chitlapakkam, Chennai 600 064, Tamil Nadu on or before 4th March, 2016. Persons with Disabilities (PH / PwD) will get 10 years additional relaxations. Resident of Karunguzhi Town Panchayat only eligible to apply. Interested and eligible candidates may forward their application form alongwith all necessary documents duly self attested to The Executive Officer, No.1, GST Road, Karunguzhi Town Panchayat, Madurantakam Taluk, Kancheepuram 603 303, Tamil Nadu on or before 3rd March, 2016 by REGISTERED / SPEED Post only. 10 years additional relaxations applicable for PwD. Enclose self addressed with Rs.25 stamped cover alongwith application form. Application envelope cover must be superscribed as "Post Applied for ....... & ..........Quota" (post name and communal roaster turn). Chennai 600 104 on or before 11th March, 2016. Send your application by Post only. The above post are permanent. Forward your filled application form along with all necessary documents to The Public Relations Officer, Kalaivanar Arangam, Omandurar Government Estate, Walaja Salai, Chennai 600 002, Tamil Nadu on or before 3rd March, 2016. Filled application form along with necessary documents to be forwarded to The Director, Directorate of Ex-servicemen's Welfare, 22, Raja Muthiah Salai, Kannappar Thidal, Chennai - 600 003 on or before 21st March, 2016. Enclose self addressed Rs.5 stamp affixed envelope. Send your application by Registered Post or Ordinary Post. Call Letter for Interview or Rejection List will be notified through http://ecourts.gov.in/krishnagiri/recruitment website only, no individual letter will send. Last date for online application 18th March 2016. Interested and eligible candidates may forward their detailed application form to The Director of NIAS by snail mail or to netajiinstitute1981@gmail.com email. Full detail of vacancies will be available from 22.02.2016. Application form also can be downloaded from official website from 22nd Feb 2016. 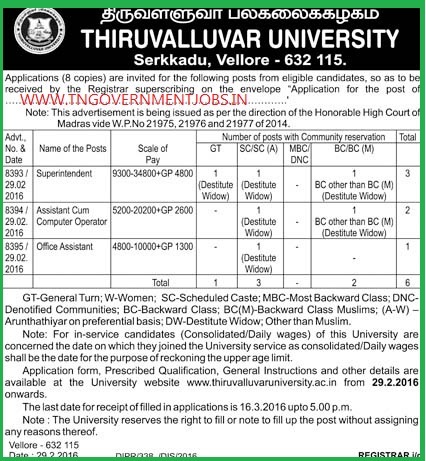 Sanitary Worker (Health Worker) - 1 Post SC Quota Non Priority - Read and Write in Tamil ; Good Physical conditions - No upper age limit. Age relaxations and roaster systems are applicable as per Government of Tamil Nadu norms. Interested and eligible candidates may forward their application form alongwith all necessary documents duly self attested to The Executive Officer, Walajabad Town Panchayat Office, Walajabad, Kancheepuram District 631 605, on or before 3rd March, 2016. The above all posts are exclusively reserved for Persons with Disabilities for the following category. Walk in Interview for Specialist Doctor Vacancies in Singareni Collieries Co. Interested and eligible candidates may attend the walk in interview on 25.02.2016 at 9 am. The above recruitment is permanent category. Application Fee Rs.200 for SC / ST candidates. 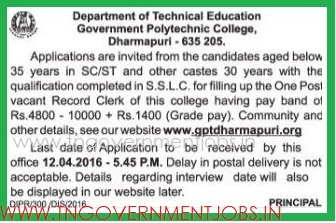 Application Fee Rs.500 for OBC / UR candidates. Qualifications and scale of pay will be apply as per UGC norms.